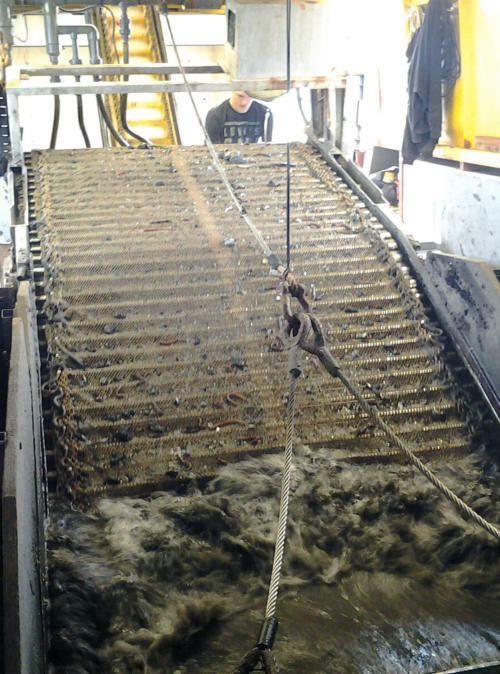 “Looking inside our boat” Since 1986 we are winning our seabait with a machined proces from the soil in the boil of the Oosterschelde. This is done with a specially designed ship. In the early years we mainly won seapiers but according to that there are fewer and fewer seapiers in the Oosterschelde. so we hade to switch to long seapiers. The extraction is done also fully automatically. The seapiers are daily fresh and in many cases the other day fresh in the shop or on board of your sport fishing boat. We supply seapiers to traders, shops and sportfishing boats from the Netherlands, Belgium, Germany and England. We have our own delivery service so we can ensure the distribution in a cooling surroundings. That the quality of zeepieren often leaves much to be desired in most fishing is known. Our quality and customer focus in a principal. By new win- techniques is the quality still further improved. There is also good news for anglers. Since June 2016 we started selling salted zeepieren. The advantage of the salted zeepieren is that they sit firmly on the hook and catch there no less by is! The DAB and Whiting's there but also other fish picks up there very good at it. These seapiers are very long shelf life in the refrigerator and in the freezer as well as unlimited. Nothing of this website may be used.